Todays card is a Man’s Shirt Card feat Junes Hedgehog Hollow Box. There are still a couple of previous boxes on the Hedgehog Hollow website. You can see the new July box here as well as some lolly taste testing. challenging myself I stuck to items mostly from the June box. Apart from ink (there was none in this box) and buttons, I succeeded. The brown patterned paper in the box threw me off, however I used it as the basis for the card. The paper reminds me of the 70’s lol. Turning over the top corner of the paper created a collar. After die cutting the pocket from the paper I stamped it with Sepia Archival ink using the Hedgehog Hollow Denim Pocket stamp set. Cutting a slit in the paper from the bottom to under the collar let me add in an accent piece. Mimicking piping that matched the folded over collar using a scrap piece of the patterned paper. Hunting through my buttons I found three thought were perfect for the shirt. After cutting the Hand Lettered Dad die from cardstock with double sided adhesive on one side three times I layered them together. Then I covered the die cut stack with the Nuvo Clear Mark Embossing Pad and sprinkled with Copper Blush embossing powder. The skin was coloured on Neenah Solar White with Copics. The buttons are stuck down with Helmar glue after adding some brown Hampton Arts twine to them. After a battle stamping the extra sentiments from the HH Masculine sentiments I made a sentiment strip to finish the card. I hope you enjoyed todays Man’s Shirt Card feat Junes Hedgehog Hollow Box. Leave me a comment below letting me know how I did with my challenge. Hope you are enjoying some arty crafty alchemy yourselves. Today I received my channels first happy mail woo hoo 🙂 We, my kids son in law and I, also went shopping at Kmart, always dangerous. 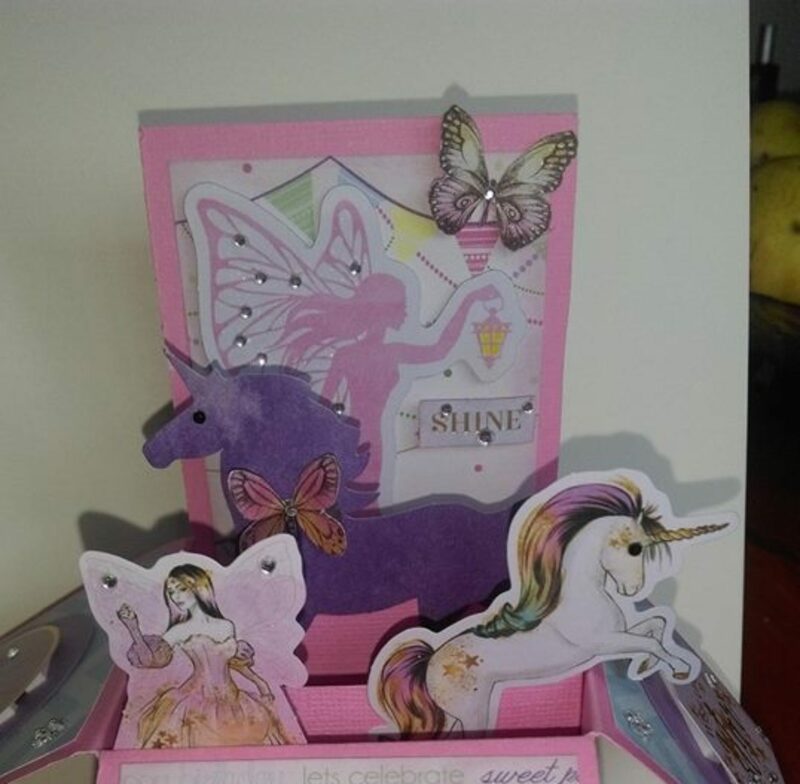 In the video I am also sharing my second Easter card from The Hedgehog Hollow Lawn Fawn February 2018 box. You can see my unboxing here and the other card you can see in this video here. First up my lovely happy mail from Alexis and Melinda Art Space, you can find them here. They do arty crafty and mixed media type things :). In the package were an alphabet stamp set, a pretty Easter bag, an Easter card, and lot’s of Eastery die cuts. Thank you Alexis and Melinda! Then I went to Kmart for 50% off Easter eggs and did a mini haul as well lol. Leaving the house is dangerous! Firstly I got some bargain Easter props for my channel for next year. Cute little metallic bunnies and a bunny jar. I also got some shredded paper for packing things nice and pretty or just adding volume to a box etc when needed. Lastly I got some notebooks for myself for you tube related things. There are notebooks here that I keep my video ideas and things in but I needed something to write out my card making process and other little things like my video intros! I find it helps to write them out before I film so I don’t fluff it up as many times lol. Onto the Easter card made with The Hedgehog Hollow February box. Love the Lawn Fawn products and have just ordered a bunch more… Happy Easter to me! I used the Some Bunny stamp set for all the stamping and Copics and Promarkers to colour the images. From the box I used the Spring Sprig and Slide On Over Semi Circle dies as well as an Elizabeth Crafts Banner set. The sentiment is stuck down with Kool Tak clear foam tape so you don’t see it underneath. I used a very smooth button for the slider mechanism so it wouldn’t catch on anything and baby powder on the tape edges so it glides nicely. What did you work on for Easter?